Invite friends into your home with a classic line of prose in the Whitehall Emerson Wall Plaque. 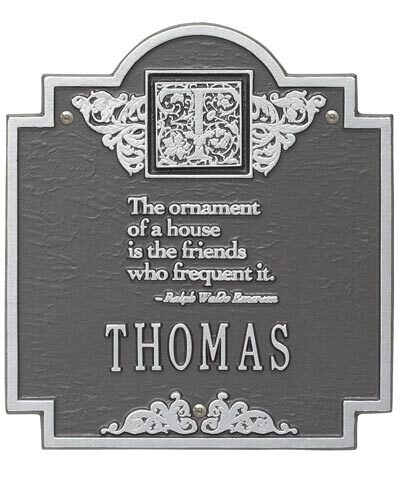 This elegant plaque reads, "The ornament of a house is the friends who frequent it." Each plaque is hand cast in recycled aluminum from a mold created specifically for your order, giving you a beautiful plaque in a single, durable piece. Choose a letter or an ornate scroll design for the top monogram, adding a lovely accent to your customized lin. This plaque may be personalized with up to twelve 1.25" characters. This attractive wall plaque will clearly showcase your name, year after year. This plaque may be wall mounted. Hand cast from recycled aluminum in the USA. A pewter plaque with silver letters is pictured to the left using the color code "PS". Simply use the spaces below to enter your personalized line. Line 1: Holds up to twelve 1.25" characters.